Former First Lady Michelle Obama talks to the audience at the Reach Higher Initiative Beating the Odds Summit on June 14, 2018, in Washington, D.C. The former first lady was the first in her family to attend college. "It was like a whole new language," Obama said. "I had never sat in a lecture, I didn't know what a syllabus was." Former first lady Michelle Obama told first-generation college freshmen to surround themselves with a community to help them survive college. Mrs. Obama was the first in her family to attend college. She said: "Finding a cohort for yourself and starting to build your community is going to be important. College wasn't meant to do alone." She spoke at the fifth annual Beating the Odds summit. Reach Higher, an education initiative launched by Mrs. Obama during her husband's presidency, partnered with Twitter and Handshake, a college-to-career network, for the daylong workshop. It included a celebrity panel with La La Anthony from the Starz show "Power" and Daveed Diggs from the blockbuster musical "Hamilton." Mrs. Obama, 54, who attended Princeton University, remembered how odd she felt her first time on the campus. "It was like a whole new language," she said. "I had never sat in a lecture, I didn't know what a syllabus was." Anthony only spent one semester at Howard University and blamed her dropping-out on a lack of encouragement and a lack of knowledge about resources that were available to help her. "I was always in a rush to get into what I thought was the 'real world,'" she said. Aniyah Fields, 18, of Washington will be the first in her family to go to college. 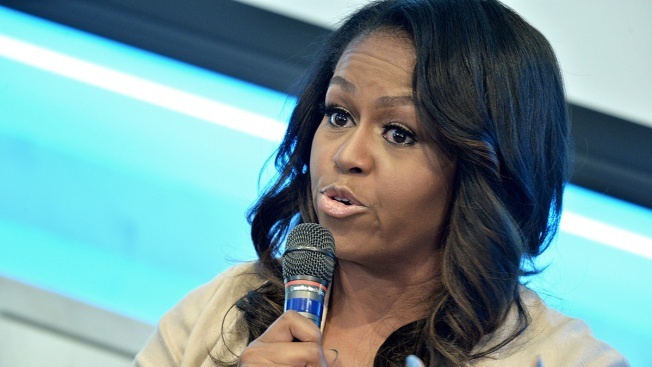 Fields, who plans to attend George Washington University this fall, said Mrs. Obama's message will encourage her to continue her education despite her difficulties. "Even though there are times I'll doubt myself, I know that those struggles have prepared me," said Fields, whose purse featured a picture of a Vogue magazine cover that the former first lady posed for in 2013. Fields plans to major in innovation and entrepreneurship with dual minors in philosophy and Spanish.